Woollatt Building Supply is proud of the long-standing relationship with Armstrong Ceiling Systems. They are the global leader in design and manufacturing of innovative commercial ceiling and wall systems. They have ceiling systems made of wood, metal, fiberglass and mineral fiber. They also offer many labour-saving products. 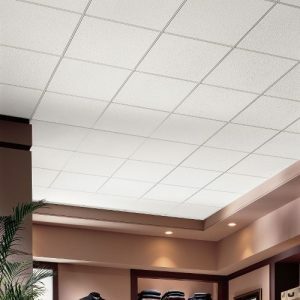 Woollatt Building Supply is your local supplier for all of your Armstrong commercial ceiling and wall needs. We stock a large inventory of products which are delivered biweekly to fulfill your Armstrong requirements. We also stock Envirowall gypsum lay in ceiling panels. They consist of a 2mil white vinyl that is laminated to gypsum. They are used with standard grid systems and the vinyl surface is very easy to clean. ABOUT ARMSTRONG: Armstrong World Industries, Inc. (AWI) is a global leader in the design and manufacture of innovative commercial and residential ceiling, wall and suspension system solutions. With over 3,700 employees and fiscal 2016 revenues from ceiling operations in excess of $1.2 billion, AWI operates from a global manufacturing network of 24 facilities, including nine plants dedicated to its WAVE joint venture. On April 1, 2016, AWI completed the separation of its legacy flooring business that now operates as Armstrong Flooring Inc., an independent, publicly-traded company. At home, at work, in healthcare facilities, classrooms, stores, or restaurants, Armstrong World Industries offers interior solutions that help to enhance comfort, save time, improve building efficiency and overall performance, and create beautiful spaces. ABOUT ENVIROWALL: Envirowall started as a family operation in 1980 and has been located at its current production facility since 1989. Over the years the company has expanded to include key personnel covering all aspects of the operation. Located in Toronto, the 50,000 square foot facility is capable of producing in excess of 100,000 square feet of quality controlled vinyl covered gypsum panels each eight hour shift. Their in stock vinyl fabrics are reviewed on a continual basis to ensure a wide choice of patterns/colours and availability.